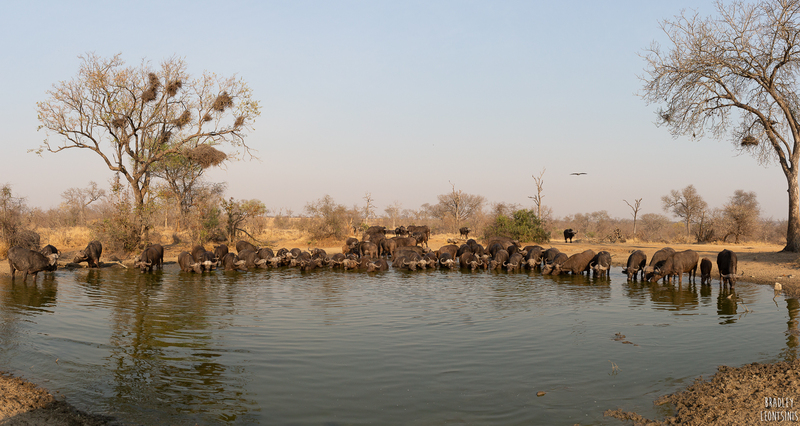 Creating Panoramas is a great way of allowing one to maximise the use of space giving a beautiful context to images. 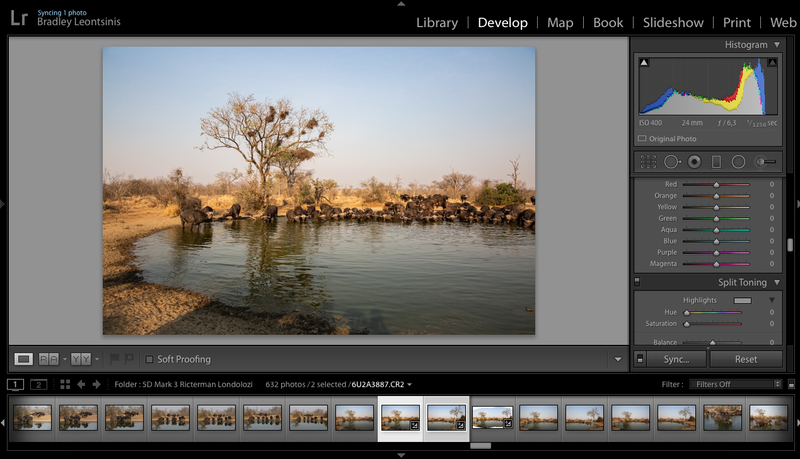 Although most useful in landscape images, using them in different scenarios for story telling can be equally effective. 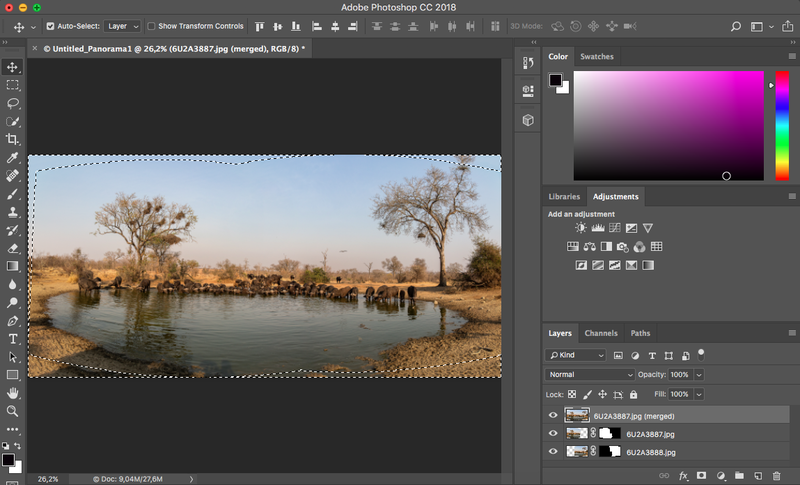 In this article we will discuss how to merge images together creating the Panoramic effect for both landscape images and story telling purposes. Look a little closer at the image above if you have not already seen it, there is a story in that image to be seen. A lioness hunting Imapala.. In wildlife and outdoor photography one of the things to always remember is how we can represent the animals in the environment surrounding our subject and how this may help tell the story unfolding in front of us. This is not always possible within a single frame. Our options are to tell the story in multiple frames or to take several shots of the broader scene with the aim of stitching the images into one large frame. Now let me be the first to say I am no expert at this art of photography but nonetheless I know how to do it so in the interests of sharing this information and learning and perfecting the art together, allow me to show you what I am talking of through some examples after which we will go step by step through the process of how. Wide angle lenses are great but no matter how wide your lens, some scenes are so grand that they just cannot be contained within a single frame. It can also be a challenge getting enough lateral space in without increasing the vertical space to the point where the subjects on the ground start to diminish or disappear. Enter the art of merging images into a panorama. Whilst I was in the Serengeti earlier this year a fascinating interaction developed. Two hunting cheetah brothers were spotted by herd after herd of Zebra and Wildebeest under some trees. Once they were seen each and every herd which came past went over to give the cats some attitude. They would get close enough to stare them down and display their displeasure, but never too close. This made for a difficult scene to shoot with two problems. 1) The bigger lenses I had with me (70 – 200mm and a 600mm) could not capture the cheetah and herds in the same frame. 2) With my wider angle lense (24 – 70mm) the scale was all out and the Cheetah and Wildebeest were tiny at the bottom of the frame with a massive vertical dimension of sky and no possible detail to be seen of the fascinating story playing out. Another example was in a once in a lifetime sighting I had with Mountain Gorillas earlier this year. This certainly was not a landscape scene. I wanted to capture the intimacy of the experience with gorillas and people and a wide angle lens was not working with the scale. Choose a scene wide enough to require several frames with your camera. Ideally the scene should have a similar lighting condition throughout. 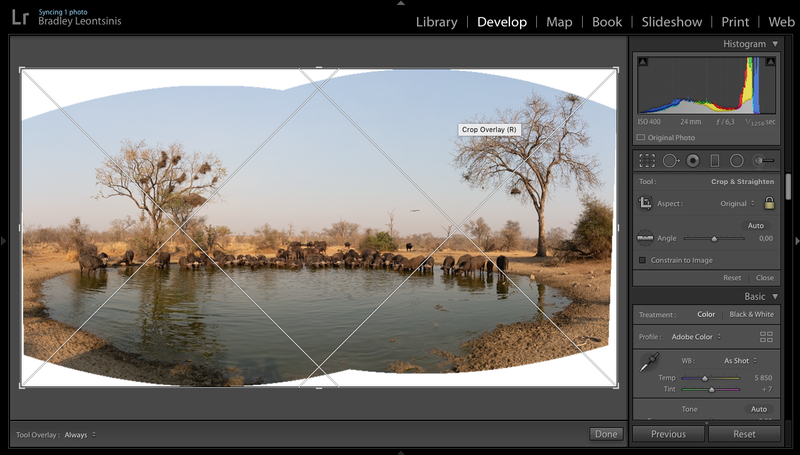 Start on the extreme of one side of the scene and take an image paying careful attention to the horizon being straight. Pick a largish object or point of reference on the far side of the first frame which will overlap into your next frame. For example a tree which the editing programme will easily be able to identify in both images. Pay careful attention to keeping your horizon or other point of reference straight in your image and make sure there is the same amount of space above the horizon and below the horizon as there was in the first frame. I.e. 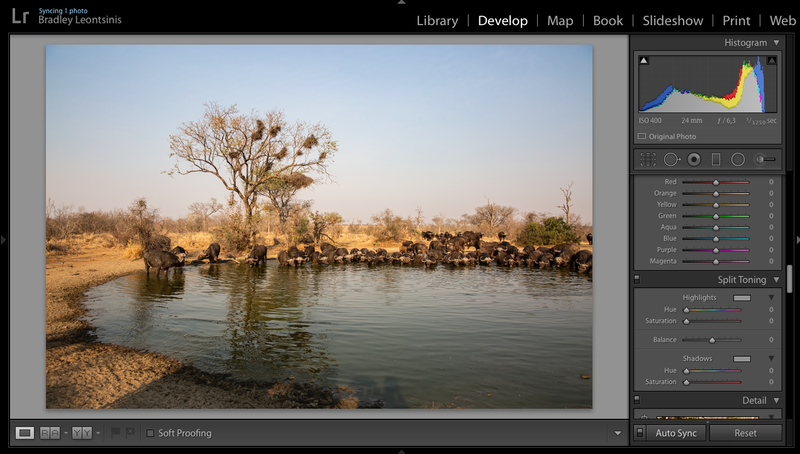 When moving along keep everything straight in your shot with the same amount of foreground and background so you are essentially moving laterally along a flat line. Work to as close a neutral exposure across the whole scene as you can. So if you are shooting in Manual Mode (M) Use your exposure indicator to get to the central or neutral exposure for each image. I find taking 2 or 3 images across the scene is generally the right amount. Taking more starts to throw things out. 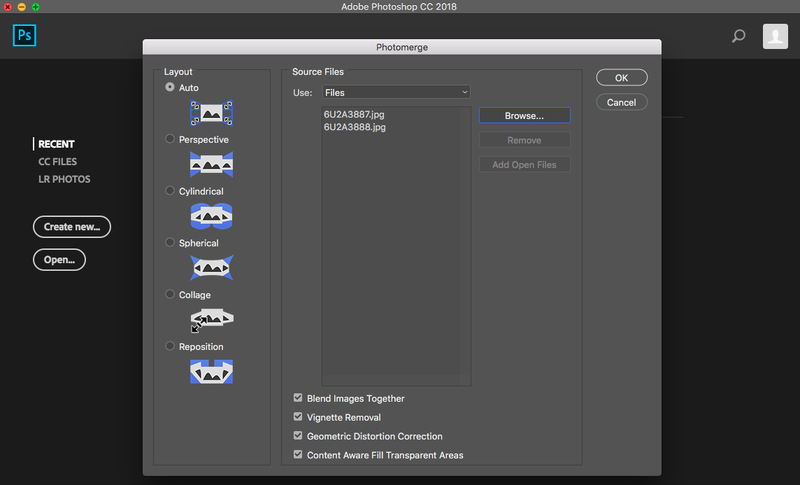 In Lightroom select the images you wish to use to merge into one frame using your CMD key to select multiple images together. Press your CMD key and SYNC will automatically turn to Auto Sync while you are holding CMD. Click the Auto Sync button which will mean that all adjustments you make to the one image will automatically do the same to the other image you have selected. 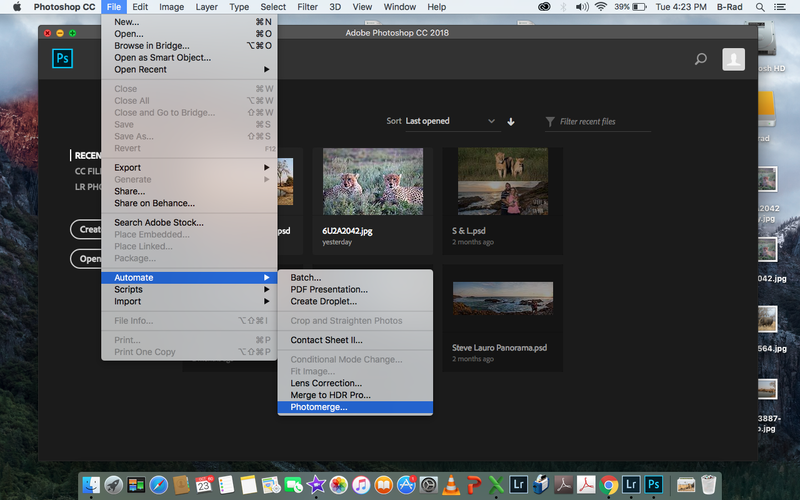 Note: Both the latest versions of Lightroom Classic CC and Photoshop 2018 CC are available in the Adobe Creative Cloud package which I highly recommend. With all the images for the merge selected, click Photo in the toolbar at the very top of your screen. The programme will then perform its magic as you wait and it will give come up with a merged photo that looks a bit like a wonky cut out. You can select Spherical or Cylindrical depending on which effect suits your image better. Then click Merge. Now you will be left with the image still with wavy borders. This is where in Photoshop we can fill in some of those gaps while in Lightroom we only have the option to crop them out. Leaving me with a final image which looks like this, once I have cropped out the white spaces. See the end of the post for the same image after Photoshop. I prefer photoshop for merging photos as it allows me to Fill in the gaps and get a more complete image, in this case allowing the inclusion of the entire tree on the right of the image. 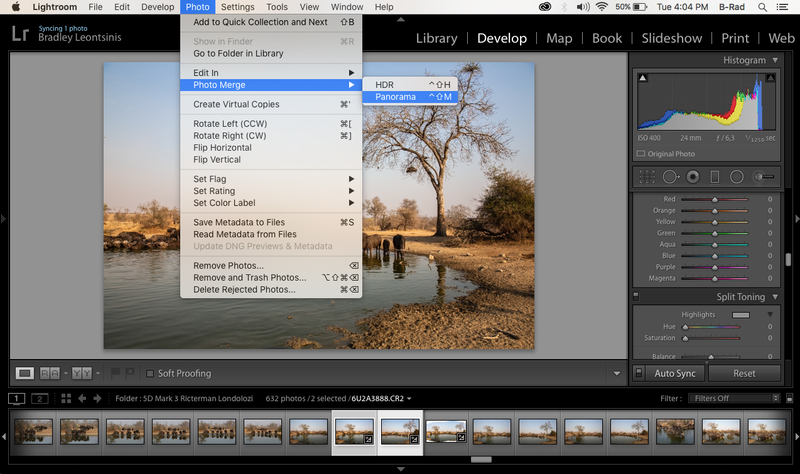 Export the images to be merged onto your desktop or chosen destination. If they look true and correct, then hold CMD and push D at the same time to Deselect those areas.